Alongside a pair of software updates for iOS and macOS, Apple on Wednesday released a new version of its Apple Store app for iOS with support for Siri Shortcuts. Siri Shortcuts support in the Apple Store app for iOS. 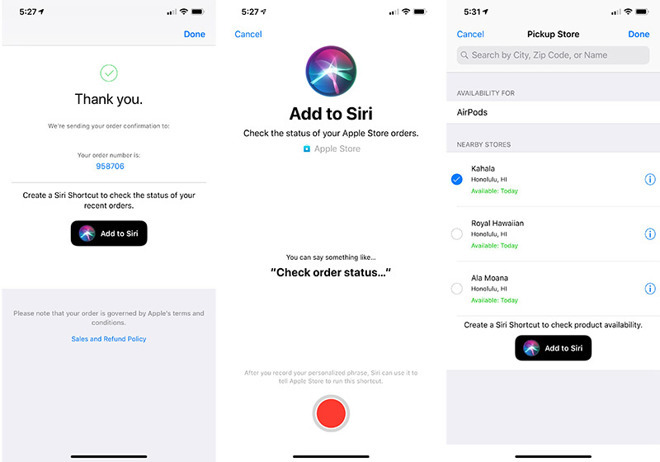 Apple Store version 5.2 brings Siri Shortcuts to Apple's dedicated retail app for the first time, allowing users to check product availability and the status of recent orders with custom voice commands. Like other Siri Shortcuts integrations, Apple Store integration enables quick access to information without opening the app. Shoppers who buy an item from the app are greeted with an "Add to Siri" button after checking out. Tapping the icon opens presents a Shortcuts pane, where users can record a custom Siri trigger that is later used to pull up information regarding the order. Product availability commands are found under the "Pickup" section. Tapping on "See more stores" opens the usual retail outlet selection window, which is now appended by an "Add to Siri" button. Activating the option allows users to record a Siri command that, when triggered, queries stock at nearby Apple store locations. In addition to Siri Shortcuts, the latest Apple Store version includes unspecified iOS 12 features that "make the app easier to use," according to Apple. Finally, the app now supports delivery options in locations throughout Puerto Rico. The Apple Store app for iOS is a free download from the App Store.